Whew! It has been one busy week...as I'm sure you can tell by the lack in posts! My hubby and I enrolled and attended orientation for Gracie's preschool. I can hardly believe this day is almost here! Gracie is 3.5 and going on 25 but she will always be my baby and it seems just like yesterday I gave birth to her. We both know as parents this day would come and we really know she will benefit from this program, its just extremely hard to "let go." Its now time to let her wings spread and become a big girl! Oh gosh...back to the cards before I weap all over my laptop. I starting making my Christmas cards last year and knew when I saw this Baroque Motifs I KNEW it would be this years card base. I tried several different options here and love every one of them, but for time and expense I'm going with the one without ribbon. This stamp is very classic and timeless and I just LOVE IT! The card base is PTI white cs and I distressed the edges. 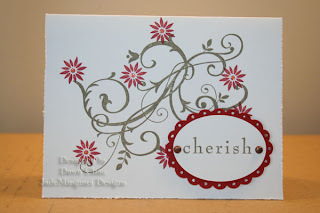 The Motif is inked in True Thyme and the flowers are inked in Cranberry Crisp. The sentiment is also Certainly Celery and cut out with my CM oval cutting system and matted on a Cranberry scalloped frame. The sentiment frame looked like it needed a bit more so I put on some MM vintage brads and dotted the scallop frame with a clear glitter pen. For little extra bling, I added glitter pen dots around the scalloped frame and the flowers are dotted with a just a dab of Star Dust Stickles. I say I'm going to be early have these addressed and ready to go by Thanksgiving, hopefully I stick with it! 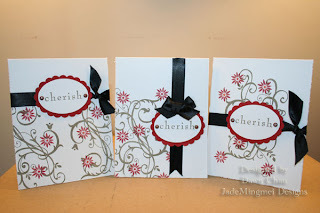 Wow, what an amazing job you did with these cards...I am patiently waiting for this stamp set to arrive. I am getting anxious because I keep seeing amazing cards made using this set. Great job :)!